A fascinating and at times heated debate on Hutton and the BBC. The panel was chaired by Roy Greenslade, media commentator and Professor of journalism at London's City University. He was editor of the Daily Mirror (1990-91), was managing editor (news) at The Sunday Times (1987-90) and assistant editor of The Sun (1981-86). 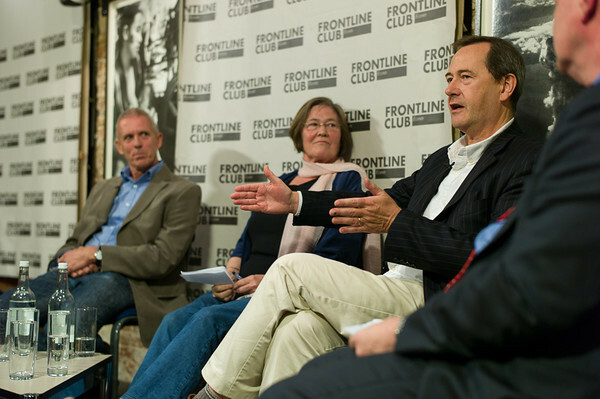 The panel were: Kevin Marsh, one of the BBC's longest-serving frontline programme editors. He has edited Radio 4's PM, The World at One, The World This Weekend and Today. Lance Price, a writer, broadcaster, commentator and executive director of the Kaleidoscope Trust. He is a former BBC Political Correspondent and Director of Communications for the Labour Party. Clare Short, former MP for Birmingham Ladywood from 1983 to 2010 and Secretary of State for International Development from 1997 to May 2003. In 2003 she resigned from the Government over the Iraq war and in 2006, she resigned the Labour whip. Professor Richard Tait CBE, Professor of Journalism and former Director of the Centre for Journalism Studies at Cardiff University.